GrubHub (NYSE: GRUB) – most readers probably know that GrubHub is a food delivery service. The company connects customers with over 80,000 restaurants in 1,600 cities. Through the company’s online platform, the customer orders from the restaurant and then a GrubHub driver delivers the order to the customer. The company was founded in 1999 and is headquartered in Chicago, Illinois. GrubHub has seen tremendous growth over the last few years. Earnings have grown at a rate of 41% per year over the last three years while sales have grown at the same annualized rate over the same period. The most recent quarterly report did show a 49% drop in earnings compared to last year, but sales were still up 40%. The company reported earnings last week and the stock initially dropped after the report, but it bounced back rather quickly. The earnings did miss the consensus estimate and increased costs were cited for the miss. GrubHub does have solid management efficiency and profitability measurements. The return on equity is at 12% and the profit margin is at 23.4%. The analysts’ ratings for GrubHub are in line with what I expected for a company growing like it has. There are 25 analysts following the stock and 17 have it rated as a “buy”. There are seven that rate the stock as a “hold” and one has it rated as a “sell”. In my experience, stocks with solid fundamentals like GrubHub tend to see approximately 65% to 75% buy ratings. In this case, 68% of total ratings are buy ratings. The short interest ratio tells a different story. GrubHub’s current short interest ratio is at 6.17 and the number of shares sold short jumped sharply in the most recent report. From December 31 through January 15, the number of shares sold short jumped from 9.58 million to 11.08 million. The chart shows how GrubHub almost reached the $150 mark in September, but then fell sharply in the fourth quarter. The stock did find support in the $67 area and has started moving back up. 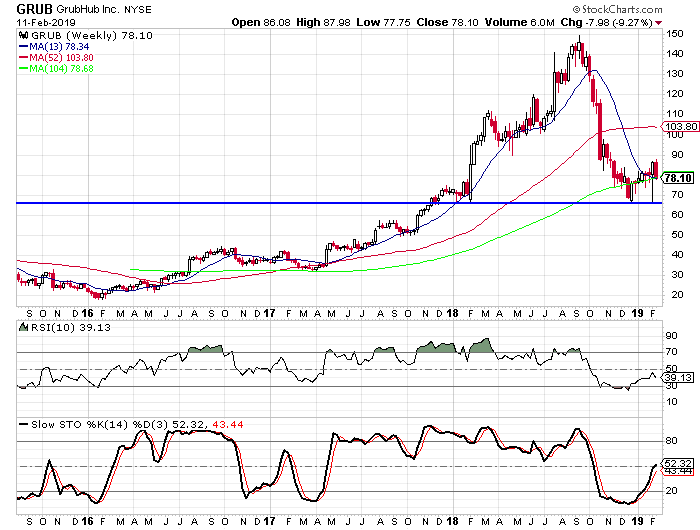 The $67 area also served as support in the first quarter of 2018. You can also see how the stock dropped to $67 last week after the earnings report, but rallied right back above the $80 level. I am encouraged by how the stock bounced back and the fact that it moved back above its 104-week moving average as well as its 13-week moving average. The stock was in oversold territory at the end of 2018 and has moved out now, but it isn’t even close to overbought territory. The stock did drop sharply on Monday and there wasn’t any specific news that I could find that was responsible for the drop. I am looking at it as a buying opportunity. Suggested strategy: Buy GRUB with a maximum entry price of $80.00. I would set a target of at least $115 over the next 9 to 12 months (for a potential return of nearly 50% from current prices). I would also suggest a stop at $65.00.